Above: Sammy Chioda. Photograph by Brian Leddy. NOT MANY PEOPLE HAVE DONE more for Gallup sports than Salvatore Chioda, affectionately known as “Sammy C.” Chioda is involved in many community organizations, including the Tony Dorsett Touchdown Football League, for which he is president and co-founder. In 2018, he was a nominee for the New Mexico Sports Hall of Fame, for his work broadcasting prep sports, and, as anybody in Gallup will tell you, he owns Sammy C’s Rock n’ Sports Pub & Grille & Coffee Bar, which CNN named one of 101 best sports bars in the nation. 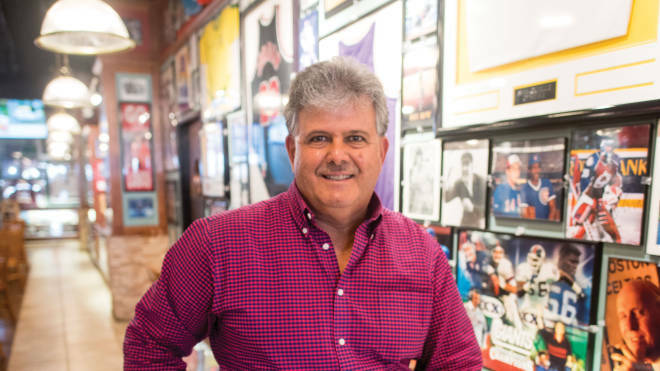 Sammy C’s features more than 5,000 pieces of sports and music memorabilia—most of them autographed. Items from Baseball Hall-of-Famers Bob Feller, Harmon Killebrew, Don Drysdale, and Mickey Mantle, plus Derek Jeter, Thurman Munson, and Pete Rose. Signed NBA jerseys of Kareem Abdul-Jabbar, Michael Jordan, Larry Bird, and Shaquille O’Neal. Guitars autographed by Ozzy Osbourne and Alice Cooper. There are signed pieces from New Mexico legends, too, including Toby Roybal, the Unsers, Alex Bregman, Don Flanagan, Michael Cooper, Jim Everett, Ty Murray, Bobby Foster, Don Perkins, Robin Cole, Ronnie Lott, Preston Dennard, Al Hurricane Jr. and Sr., Jimmy Dale Gilmore, Bo Diddley, and new Pro Football Hall of Famer (and Lovington hometown hero) Brian Urlacher. There’s also a tribute to Gallup native Hiroshi “Hershey” Miyamura, who won the Congressional Medal of Honor for his bravery during the Korean War. For Chioda, it’s all in service to his community. My parents came over from Italy in 1954. Mom was pregnant with me as they came over the Atlantic. They landed at Ellis Island and worked their way west—they had family here because of coal mining in Gallup. They arrived during the Inter-Tribal Indian Ceremonial, and when they got off the train, they saw this big festival with all the dancers in the area. They thought it was a celebration welcoming them. I was always fascinated by the radio business. I started in 1969. I loved Top 40, and it was always something I wanted to do. I love going to work every day. After 50 years, I still love doing it. I have become very successful, and when I look back at my 50 years in the business, I just feel like I have no regrets whatsoever. I’ve been able to do a lot of things. It’s the same thing with Sammy C’s. Everybody was like “Why did you do this in Gallup?” Gallup deserves a nice place like this. It’s our Native American arts and crafts and our style of cuisine, with New Mexico red and green chile. It’s the cultural diversity. I work the crowd every time I walk in here. I’ll go from table to table and greet everybody, whether I know them or I don’t know them. I know my clientele pretty well, the regulars in here every week. I always make it a point to go and introduce myself. What drives me? I was raised by parents with a strong work ethic. Nothing was ever handed to my parents. Being a first-generation Italian American, I saw them work, sometimes around the clock, to make ends meet and provide for our family. It is through hard work, dedication, perseverance, and approaching life with a winning attitude that progress is made. This is what I have always based my life on. Sports are the balance to life for many people. You know what I like most about New Mexico? The rich traditions, cultures, and heritage. Sammy C’s has 27 taps and 30 TVs for enjoying the next big game.